Adult. Intermediate phase. 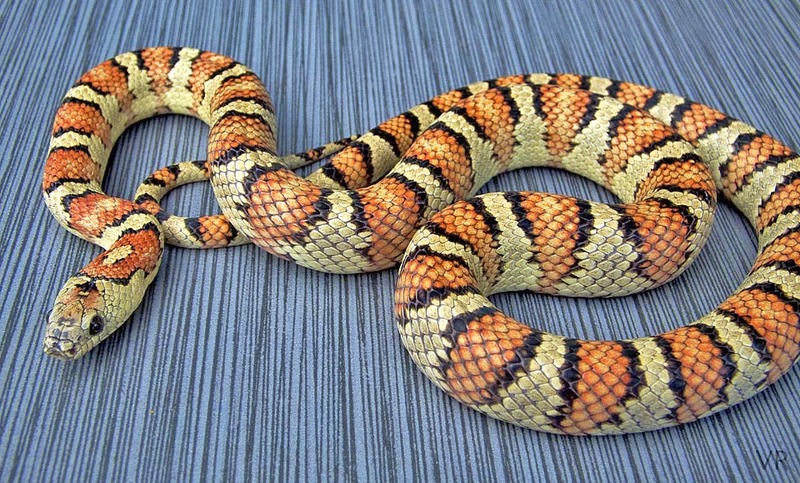 This Variable Kingsnake lands firmly in the middle ground between leonis and milk snake pattern phases. It is not clear if this intermediate pattern type is locality related or just another part of the thayeri variability spectrum. The snake presented above is unique in several qualities as have been all of the Laredo derived specimens. The background color is a soft yellowish buckskin, very light in tone. The background or base color is covered with a mist of very fine stippling that keeps the yellow in check. The orange of the primaries has steadily faded with each shed until it is now a pale pastel allowing the beautiful background color to shine through.